A few days back I got one of those BBM messages which looked like SPAM – Like this page on Facebook and you could help a friend. IGNORED. But then I got an email from a cousin who pointed me out to the interesting initiative by a group of BBM Students from R.D National College in Mumbai. I really don’t need to write much, take a look and see for yourself how a college project which was done for a few marks has spread and hopefully will let more know about the effects of drink & drive. I think it’s a good effort by the students to show their responsibility and I did my bit – Liked the Facebook page and I hope to spread the word around by this blog post. Go ahead, do your bit too. If you are fed up of the menace of drinking and driving which often costs death of innocent lives then you ought to be a part of this campaign. 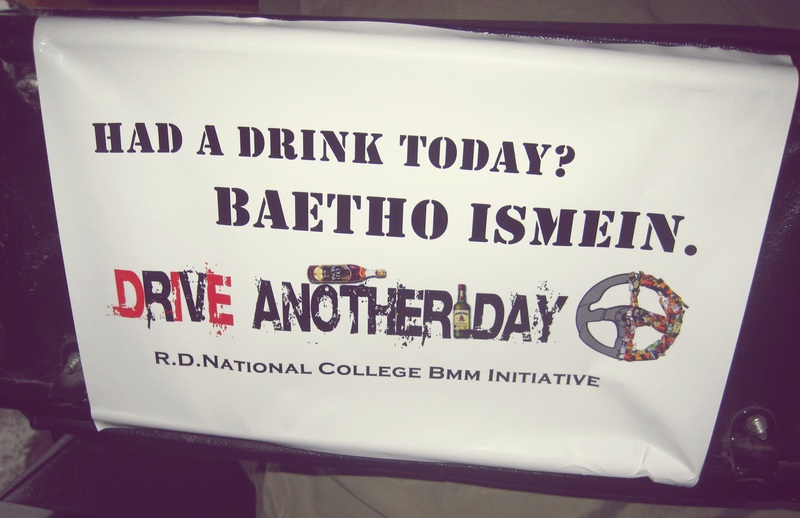 Five students from R.D National College, Bandra- Shraddha Chauhan, Shweta Bharat, Uma Rane, Nirali Marfatia and Rahul Lalchandani- have launched the Drive Another Day campaign that hopes to reduce the number of deaths caused by drinking and driving by making people more responsible for their deeds. It started off with multiple ground level activities and now has a Facebook page which has already received more than 1000 likes. The campaign started off as a Media Planning project for the college but the students decided to make it effective by taking it outside. People usually think that they can drive normally after drinking without realizing the fact that beyond 0.08 mg their vision also starts blurring. Through the help of this campaign the students are positive about encouraging people not to drink and drive which was launched on 2nd September. 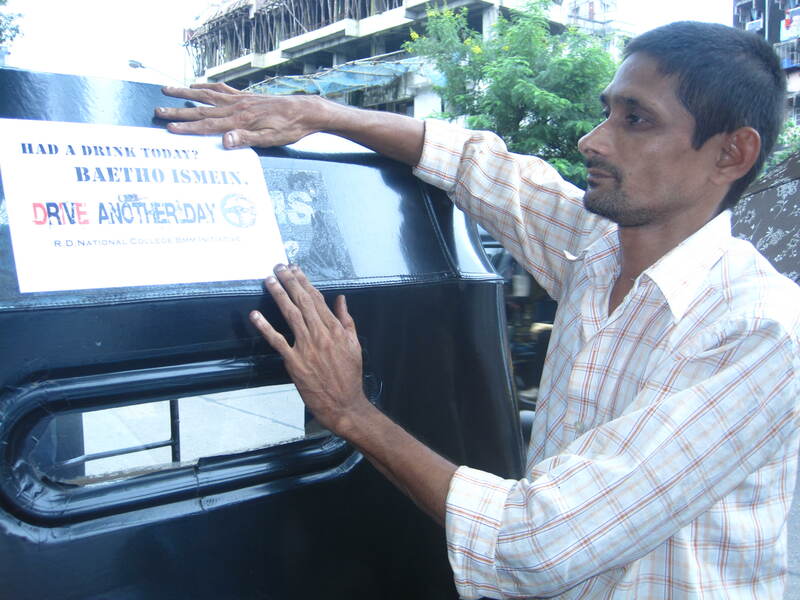 As a part of the campaign the students have carried out activities like sticking posters behind some 50 odd rickshaws carrying out messages like “ Had a Drink today? Baetho Ismei. Drive Another Day”. They also utilized the premises of a popular hangout in Bandra known as Bonobo by displaying a dummy dead body of a victim of drink and drive with a message “This Could be You”, which cautioned passerby’s as well as the visitors at Bonobo to give up the practice of drinking and driving. There were valet cards displaying campaign messages given out to Bonobo visitors along with their valet parking card tag. Apart from this, the students also got a pledge petition signed by the crowd who were supporting the campaign which urged them to take a pledge that they will never drive under the influence of alcohol. Next up, they plan to create a viral video documenting the ill effects of drinking and driving and put it up on YouTube. They will also soon be creating an online game which discourages the practice of drinking and driving. Join the Drive Another Day effort on their Facebook Page.